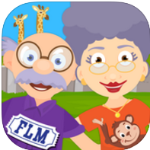 I love the apps in Grandpa and Grandma series. 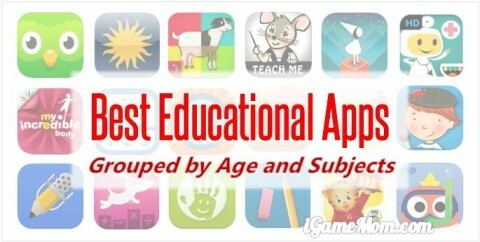 They are learning apps, yet they are also very fun and kids love to play with them. The most recently one is In the Zoo with Grandma and Grandpa. It is designed for kids from preschool and up, and like other apps in the series, there are many fun games with built in learnings in them. Fix the sign: When kids enter the zoo, they will see a sign with an animal name. But before they can even read the sign, all letters on the sign fall off and kids must help to put the letters back to position, and they have to put up the letters one by one in order. Color the animal: This zebra is missing its stripes! Can you color some new ones? Kids can pick the color they want, and color the animals the way to want to. Every time kids pick up a new color they will hear the name of the color be said aloud to them. Animal Sounds: With the closed, kids will hear a sound and asked to pick the animal who makes the sound from 4 choices. Tram math: who doesn’t like to ride the train in the zoo? But before the train leaves, let’s figure out how many people are on the train. Of course, this requires a simple math exercise. Animal puzzles: it is a 6-piece jigsaw puzzle, with an animal picture. 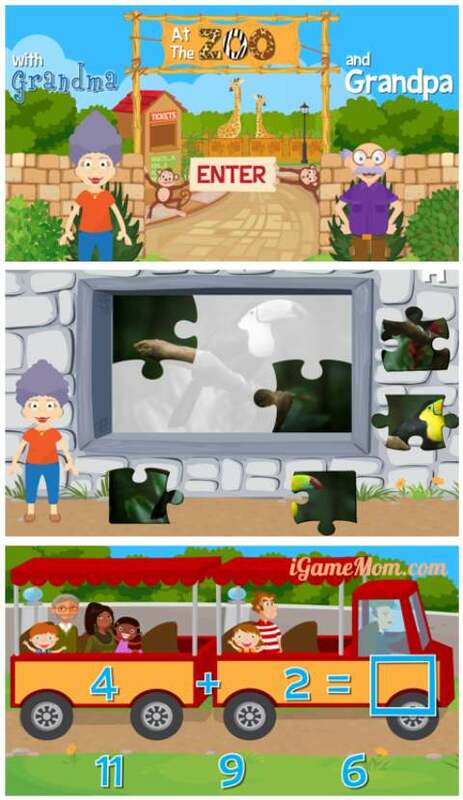 Each time when kids finish the puzzle, they will see which animal is on the picture and hear the name of the animal, plus a fun fact about the animal. Spot the difference: kids see several animals of the same type and need identify the one that looks a little different. Fossil dig: This one requires a lot patience. Kids will dig and clean up the sand to find the animal fossil buried in the soil. Seal Show: kids move the seal to catch the ball and make sure the ball will not fall into the water. This is a fun one to play. Signs to animal: Kids will match the signs with the animals. Kids need be able to read to play this game. Feed the penguin: It is probably hardest game in this app. Kids are asked to move the penguins to the fish. However, since it is all ice, the penguins can’t stop unless they hit the wall or ice blocks. Kids have to learn to use the blocks to help the penguins to stop at the fish. Kids don’t have to play all the games. Parents can go into setting to pick the games that fit their children’s level and interest. Every time kids finish one round of games, they are rewarded with an animal toy to keep. There are also 10 short animal related videos kids can watch. Once a while kids will get rewards of grandpa’s high fives or snacks, which are always fun. 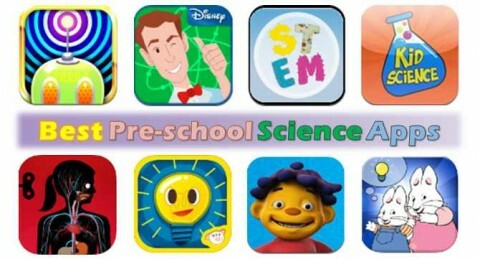 For more fun learning apps for young children, please visit Best Science Apps for Preschool Kids, or more app ideas Best Educational Apps for Kids, grouped by Age and Subject.